Olsenella uli (Olsen et al. 1991) Dewhirst et al. 2001 is the type species of the genus Olsenella, which belongs to the actinobacterial family Coriobacteriaceae. The species is of interest because it is frequently isolated from dental plaque in periodontitis patients and can cause primary endodontic infection. 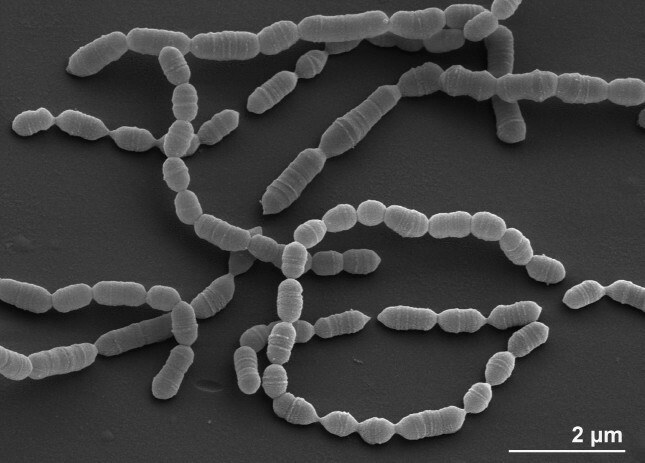 The species is a Gram-positive, non-motile and non-sporulating bacterium. The strain described in this study was isolated from human gingival crevices. This is the first completed sequence of the genus Olsenella and the fifth sequence from a member of the family Coriobacteriaceae. The 2,051,896 bp long genome with its 1,795 protein-coding and 55 RNA genes is a part of the Genomic Encyclopedia of Bacteria and Archaea project. Strain VPI D76D-27CT (= DSM 7084 = ATCC 49627 = JCM 12494) is the type strain of the species Olsenella uli, which is the type species of the genus Olsenella . Currently, Olsenella is one out of thirteen genera in the family Coriobacteriaceae [2–4]. This strain was first described in 1991 by Olsen as ‘Lactobacillus uli’ . Based on 16S rRNA gene sequence divergence and the presence of unique phenotypic characters, the strain was transferred to the new genus Olsenella as O. uli. A second novel species, O. profusa was also described . More recently, a third species, ‘O. umbonata’, was described but is not yet validly published .The genus is named in honor of Ingar Olsen, a contemporary Norwegian microbiologist, who first described ‘L. uli’. The species epithet ‘uli’ means ‘of the gum’. Periradicular diseases are arguably among the most common human inflammatory diseases , which are often the result of microbial infection of the root canal . Olsenella species, particularly O. uli, are common members of the microbiota associated with primary endodontic infection. O. uli has been found to predominate over other Gram-positive rods, (e.g., Atopobium parvulum)  in root canal samples taken after chemomechanical preparation and intracanal medication, suggesting that this species can resist intracanal disinfection measures and thus may be involved in persistent infections [10,11]. Here we present a summary classification and a set of features for O. uli VPI D76D-27CT, together with the description of the complete genomic sequencing and annotation. Strains from the genus Olsenella are found in human oral cavity and likely in bovine rumen . Strain VPI D76D-27CT was isolated from either human gingival crevices or periodontal pockets . The 16S rRNA gene sequence of VPI D76D-27CT is 97% identical to the cultivable strains N13-17 (AY880046) and S13-10 (AY880047). These strains were isolated from a 63-year old male patient with oral squamous-cell carcinoma . Two other uncultured clone sequences with 100% 16S rRNA gene sequence identity to strain VPI D76D-27CT were reported at the Genbank database (status July 2010) . These were clone OPEN_ROOT_17 (FJ982973), isolated from human root canal, and clone BS34 (AY244985) from cow rumen. The 16S rRNA gene of strain VPI D76D-27CT shares 96.7-96.8% sequence identity with the sequences of the type strains from the other members of the genus Olsenella , whereas the other type strains from the family Coriobacteriaceae share 87.3 to 96.7% sequence identity . No phylotypes from environmental screenings or genomic surveys could be linked to the species O. uli or to the genus Olsenella, indicating a rather rare occurrence of these in the habitats screened thus far (as of July 2010). The cells of strain VPI D76D-27CT are nonmotile (Table 1), Gram-positive rods that occur singly, in pairs, and in short chains (Figure 1) . The central part of the cell may swell; particularly when grown on solid medium. Strain VPI D76D-27CT is microaerotolerant to anaerobic  with an optimal growth temperature is 37°C . Colonies on brain heart blood agar are one to two mm in diameter, raised or low convex, entire, and translucent to transparent after five days of anaerobic incubation at 37°C . The cells are unable to grow on media with 6.5% w/v of NaCl. Growth is stimulated by Tween 80 (0.02% v/v). Strain VPI D76D-27CT is able to ferment glycogen, trehalose and starch. Fermentation products from glucose are lactic, acetic, formic and occasionally trace amounts of succinic acid. Lactic acid is a major product of the strain VPI D76D-27CT , a feature which was suspected to be important in inflammatory processes of endodontic infections [1,19]. There is little or no gas detected in agar deeps during cell growth. Hydrogen and indole are not produced. Reactions are negative for bile-esculin, DNase and hippurate hydrolysis. This strain does not ferment amygdalin, erythriol, esculin, glycerol, inositol, mannitol, melezitose, melibiose, raffinose, rhamnose, sorbitol and xylose. Acid is produced from fructose, glucose, maltose, mannose, salicin, and sucrose . Strain VPI D76D-27CT does not liquefy gelatin, does not digest meat, does not produce indole, and does not reduce nitrate . It is negative for bile-esculin, DNase, hippurate hydrolysis and catalase activity. However, strain VPI D76D-27CT hydrolyses esculin and produces ammonia from arginine . Classification and general features of O. uli VPI D76D-27CT according to the MIGS recommendations . Strain VPI D76D-27CT possesses a peptidoglycan type of A4ß based on L-Orn-D-Asp . The major cellular fatty acids of strain VPI D76D-27CT (FAME: fatty acid methyl ester; DMA: dimethylacetyl), when grown in peptone-yeast extract-glucose-Tween 80 broth, are C18:1 cis9 (32.1%, FAME), C18:1 (19.9%, DMA), C10:0 (10.1%, FAME), C17:1 cis8 (6.9%, FAME), C18:1 c11/t9/t6 (5.3%, FAME), C16:1 cis9 (4.8%, FAME), C16:0 (4.0%, DMA), C18:1 cis11 (3.6%, DMA), C14:0 (3.1%, FAME), C16:0 (2.8%, FAME) and C12:0 (2.6%, FAME) . More recent data show a somewhat different fatty acid pattern, which is characterized by a large proportion of unbranched fatty acids (C18:0, 31–50%) and a quite large proportion of polyunsaturated fatty acids (C18:2 cis-9, cis-12; 5.6–8.4%). Presumably, this difference may be attributed to the different growth medium, which is described to be M2 liquid medium containing clarified rumen fluid . Figure 2 shows the phylogenetic neighborhood of O. uli VPI D76D-27CT in a 16S rRNA based tree. 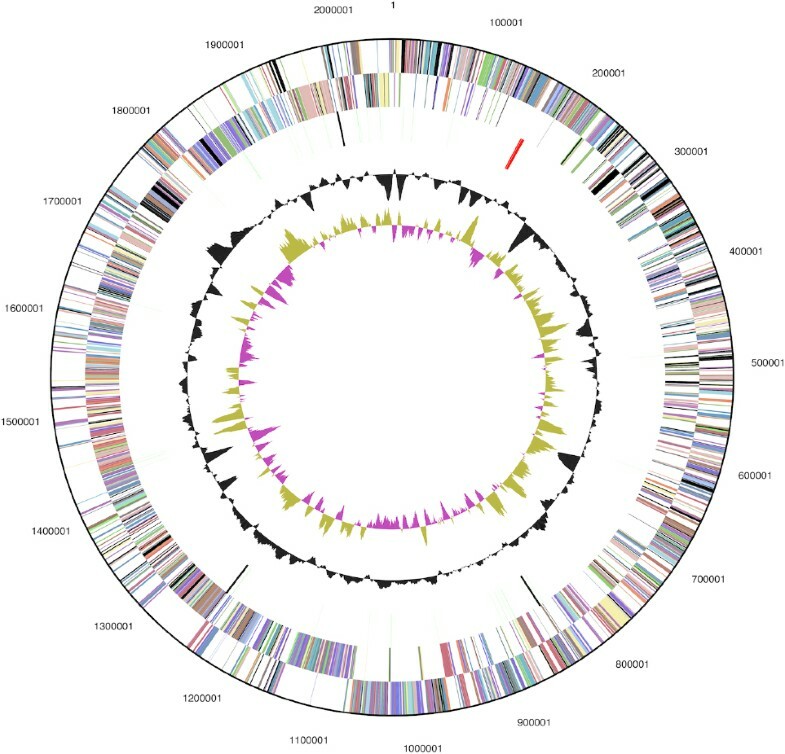 The sequence of the unique 16S rRNA gene is identical with the previously published sequence generated from ATCC 49627 (AF292373). Phylogenetic tree highlighting the position of O. uli VPI D76D-27CT relative to the type strains within the genus and the type strains of the other genera within the family Coriobacteriaceae. The trees were inferred from 1,408 aligned characters [24,25] of the 16S rRNA gene sequence under the maximum likelihood criterion  and as far as possible (note: Olsenella is paraphyletic in this tree) rooted in accordance with the current taxonomy . The branches are scaled in terms of the expected number of substitutions per site. Numbers above branches are support values from 250 bootstrap replicates  if larger than 60%. Lineages with type strain genome sequencing projects registered in GOLD  are shown in blue, published genomes in bold [30,31]. Adding the 16S rRNA sequence of the type strain of the not yet validly published species ‘Olsenella umbonata’ (FN178463) to the tree (data not shown) did not change the overall arrangement; ‘O. umbonata’ appeared within the grade between O. uli and O. profusa. O. uli VPI D76D-27CT, DSM 3776, was grown in medium 104 (PYG modified medium)  at 37°C under strictly anaerobic conditions. DNA was isolated from 0.5–1 g of cell paste using MasterPure Gram Positive DNA Purification Kit (Epicentre MGP04100) following the standard protocol as recommended by the manufacturer, with modification st/LALM for cell lysis as described in . The genome of O. uli was sequenced using a combination of Illumina and 454 technologies. An Illumina GAii shotgun library with reads of 434,617,748 bp, a 454 Titanium draft library with average read length of 302 +/− 162.3 bp bases, and a paired end 454 library with average insert size of 9.273 +/− 2.318 kb were generated. All general aspects of library construction and sequencing can be found at http://www.jgi.doe.gov/. Illumina sequencing data was assembled with VELVET, and the consensus sequences were shredded into 1.5 kb overlapped fake reads and assembled together with the 454 data. Draft assemblies were based on 2.0 Mb 454 draft data, and 454 paired end data. Newbler parameters are -consed -a 50 -l 350 -g -m -ml 20. The initial Newbler assembly contained 149 contigs in 1 scaffold. We converted the initial 454 assembly into a phrap assembly by making fake reads from the consensus, collecting the read pairs in the 454 paired end library. The Phred/Phrap/Consed software package (www.phrap.com) was used for sequence assembly and quality assessment  in the following finishing process. After the shotgun stage, reads were assembled with parallel phrap (High Performance Software, LLC). Possible mis-assemblies were corrected with gapResolution (http://www.jgi.doe.gov/), Dupfinisher , or sequencing cloned bridging PCR fragments with subcloning or transposon bombing (Epicentre Biotechnologies, Madison, WI). Gaps between contigs were closed by editing in Consed, by PCR and by Bubble PCR primer walks (J.-F. Chang, unpublished). A total of 394 additional Sanger reactions were necessary to close gaps and to raise the quality of the finished sequence. Illumina reads were also used to improve the final consensus quality using an in-house developed tool (the Polisher ,). The error rate of the final genome sequence is less than 1 in 100,000. The genome consists of a 2,051,896 bp long chromosome with a 64.7% GC content (Table 3 and Figure 3). Of the 1,850 genes predicted, 1,795 were protein-coding genes, and 55 RNAs; fifty six pseudogenes were also identified. The majority of the protein-coding genes (75.9%) were assigned a putative function while the remaining ones were annotated as hypothetical proteins. The distribution of genes into COGs functional categories is presented in Table 4. We would like to gratefully acknowledge the help of Gabriele Gehrich-Schröter to growing O. uli and Susanne Schneider for DNA extraction and quality analysis (both at DSMZ). This work was performed under the auspices of the US Department of Energy Office of Science, Biological and Environmental Research Program, and by the University of California, Lawrence Berkeley National Laboratory under contract No. DE-AC02-05CH11231, Lawrence Livermore National Laboratory under Contract No. DE-AC52-07NA27344, and Los Alamos National Laboratory under contract No. DE-AC02-06NA25396, UT-Battelle and Oak Ridge National Laboratory under contract DE-AC05-00OR22725, as well as German Research Foundation (DFG) INST 599/1-2 and Thailand Research Fund Royal Golden Jubilee Ph.D. Program No. PHD/0019/2548′ for MY.